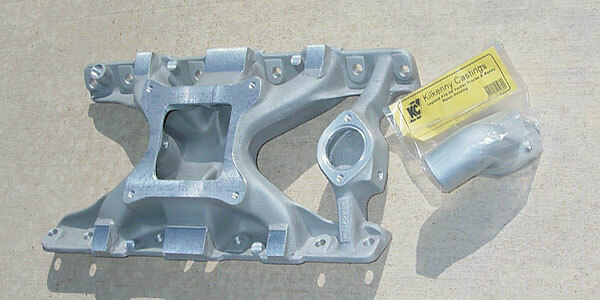 Willpower single-plane intake manifold for the Buick/Olds/Rover aluminum V8. Intake manifold design is part science, part art, and a little bit of magic. Intakes are available in a dizzying array of types and designs. Looking through some of the catalogs, there are listings for Torker, A-CELerator, Tunnel Ram, Hi-Rise, Performer, Performer RPM, Port-O-Sonic, Cross Flow, 360 degree Equa-Flow, RamJet - and the list goes on. 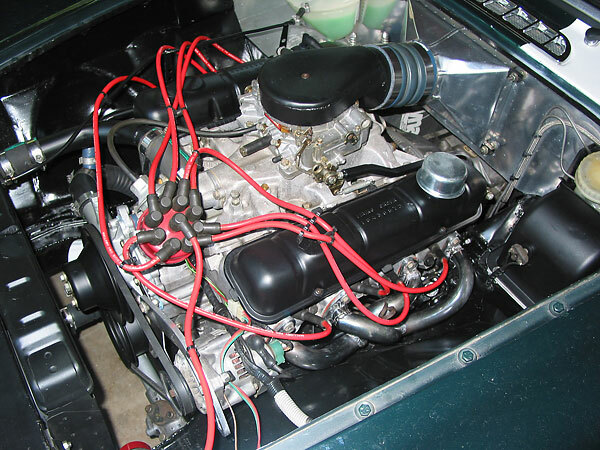 Choosing the correct intake for your conversion can be a daunting task. Get the right one, and your engine will be a sweet performer, choose the wrong one, and your engine will be a pig. In his book "How To Build Horse Power," David Vizard reported as much as 70 HP difference between various intakes on a small block Chevy. 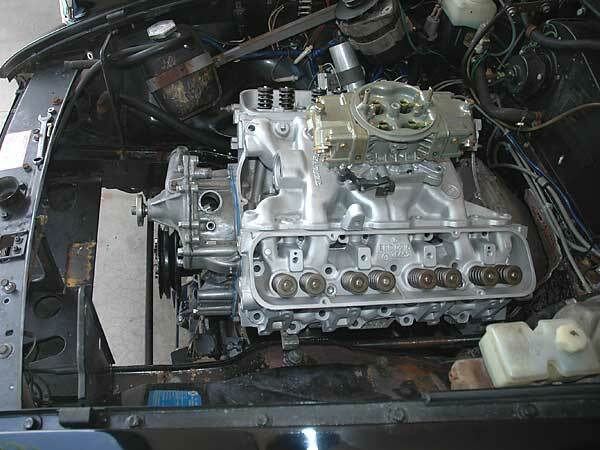 Generally, intake manifolds come in two major categories: single-plane or dual-plane. In a single-plane manifold, there is just one hole under the carburetor; in a dual-plane, there are two holes under the carburetor. In the single-plane configuration, all cylinders of the engine draw from all barrels of the carburetor. In the dual-plane configuration, the opening under the carburetor is divided into two halves, such that one half of the cylinders draw from two barrels (primary and secondary), while the other half draw from the other two barrels. 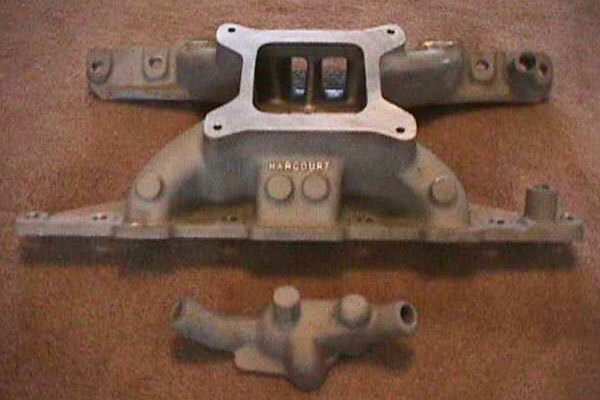 John Harcourt in New Zealand offers the HC-14 single-plane intake manifold for racing. 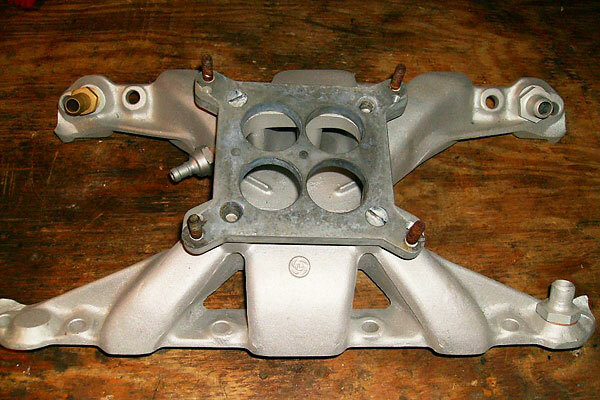 Developed in the 1960's and still popular, this is Offenhauser's "360" (5165) single-plane intake manifold. Huffaker Engineering of California developed this single-plane manifold for British Leyland Motorsport. Rule: "Single-plane" is better at high RPM; "Dual-plane" is better at low RPM. At low rpm, the intake vacuum signal from each cylinder is fairly small. Dividing this small signal between both primaries in a single-plane manifold results in a weakened air flow through the carburetor, resulting in poor low RPM performance. At high RPM, the intake vacuum signal is high enough to draw properly through all four barrels - primaries and secondaries - so the engine runs strongly at the elevated RPM range. The converse is true for a dual-plane intake. At low RPM, the vacuum signal from each cylinder is sent to only one side of the carburetor, resulting in a good air flow. 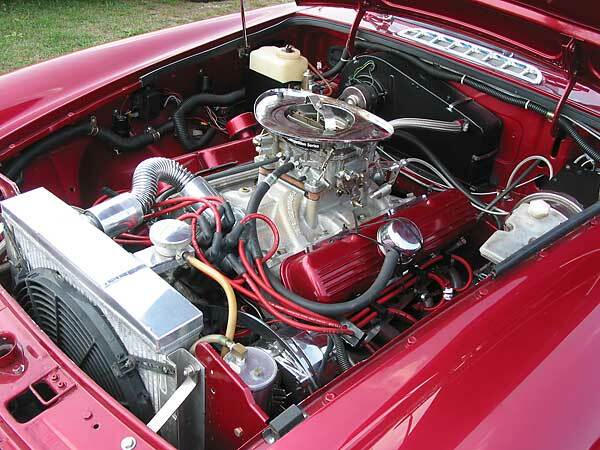 At high RPM, however, airflow through only one side of the carburetor may be restricted, choking the engine. As with anything, comprises may be made. Basically, if a single-plane intake is designed for low speed operation, the high speed benefits will be lost, and if a dual-plane intake is designed for high speed operation, performance will be reduced at low speed. All of the other intake designs mentioned earlier are based on one or the other of the dual/single-plane principle. The first consideration, therefore, in selecting an intake should be your preferred driving style. For most of us, low speed torque will give the most pleasing results - how many of us will consistently operate our engines in the 5000rpm range? 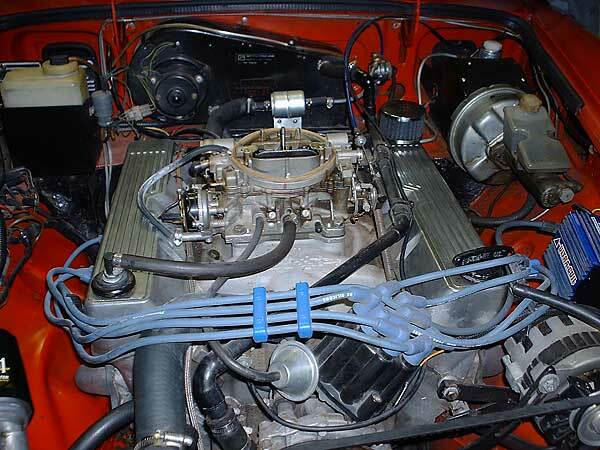 Buick's original, very low height, dual-plane intake manifold design is still a favorite. Offenhauser's "John Woolf Racing" 7001-DP dual-plane intake manifold is almost as low. Once that has been decided, your search for an intake can begin. You have two options for selecting an intake. The first option is to spend time on a dyno, swapping intakes until you find the right one. If this option is open to you, then you probably won't be reading this article. The other option is to compare results found by others, using the same or similar engine combination - cam, compression ratio, bore/stroke, etc. - as you are using. If you have a Chevy or a Ford V8, you're in luck, because all of the major "hot rod" type magazines run frequent articles on performance testing of various intakes, and a search through back issues at your local library should give you all the data you need for your decision. For those of you using the BOP/Rover engine, you're not as lucky. The mainstream magazines seldom report on these engines. Your best source of information is this newsletter, and contacts with other BOP/Rover owners. Disclaimer: This page was researched and written by Dan Masters. Views expressed are those of the author, and are provided without warrantee or guarantee. Apply at your own risk. This article was unillustrated when originally published in British V8 Newsletter, Volume 9 Issue 2, May 2001. Photos by Tony Hoffer, Greg Williams, Richard Morris, Mike Perkins, Curtis Jacobson, Martyn Harvey and Curtis Jacobson respectively - from the BritishV8 photo gallery and archives - and captions written by Curtis Jacobson, have been added with internet publication.